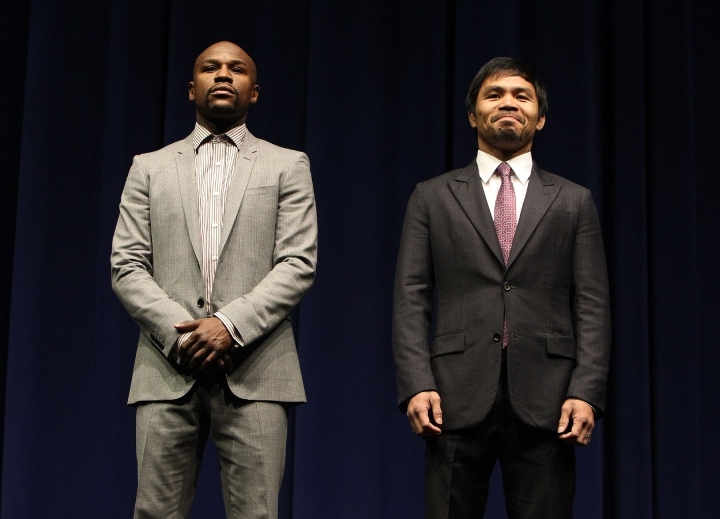 Manny Pacquiao is a man with options. He was ringside at AT&T Stadium on Saturday night and cordially engaged potential opponent Errol Spence Jr. after the IBF welterweight champ pitched a scorecard shutout over Mikey Garcia. That fight could happen as soon as July, given Pacquiao’s liberty from the Filipino senate around that time and Spence’s willingness to make it convenient for his would-be blockbuster marquee foil. But all indicators suggest Pacquiao wants something else. “Floyd would be the preference, unfinished business,” said Fred Sternburg, Pacquiao’s long-time publicist at Top Rank and now that the 40-year-old is affiliated with Al Haymon. Trainer Freddie Roach told Boxing Scene in December that a rematch with Mayweather is indeed his famous charge’s first choice, even amid a promotional stable that includes Spence and fellow champions Keith Thurman (WBA) and Shawn Porter (WBC). Sternburg, who was with Pacquiao in Dallas, said it’s no cinch that “Money” wants another go-round. Mayweather, now 42, beat Pacquiao in May 2015, then retired after out-pointing Andre Berto four months later. He beat boxing novice Conor McGregor in a pay-per-view circus in 2017 and recently returned to stop a Japanese MMA fighter in a highly-publicized exhibition. He’s been coy about plans with Pacquiao, but was also in Dallas and sat ringside for Pacquiao’s defeat of Adrien Broner in January. Sternburg says he saw some cracks. Given that unclear reality, we’re left to our own devices to determine who’d win if they get together again. But until it happens, we can at least compare the two in the overall scheme of things, namely who has had a better professional run since lacing up the gloves. Instead of re-measuring their heights, weights and shoulder-to-knuckle reaches side by side, the analysis is done by looking at each man’s body of work in the weight classes they’ve had in common – and adding a few categories to even out the mitigating career factors. Summary: It was at 130 pounds that a 20-something “Pretty Boy” first reached the public consciousness, won his first world championship and downed the previously unbeaten Corrales (TKO 10) in a five-knockdown WBC title defense in 2001. He left the division two fights later to campaign at lightweight. Summary: The super featherweights were a three-year staging area for the Filipino, who already had titles at three weights and his eyes on bigger things. He opened the run with a surprise loss to Morales in 2005, before rebounding to beat him twice and top Barrera and Marquez in rematches from 126. While Pacquiao has the more celebrated individual scalps at 130, Mayweather dominated a two-time champion to capture his championship (Hernandez) and ended both a 23-fight win streak (Manfredy) and a 33-fight win streak (Corrales) in subsequent one-sided title defenses. Had he stayed there for a prolonged period, he’d likely be listed as one of its top all-time champs. Summary: Although he had several bouts during his early career that were within the lightweight confines, Mayweather arrived at 135 with a controversial 2002 verdict over Castillo that many insist he lost. He won a rematch eight months later, defended twice more and then headed to 140. Summary: It was one and done in the division for Pacquiao, who aimed directly for stablemate and WBC champ Diaz rather than face Nate Campbell, who had beaten consensus champ Juan Diaz and held the IBF, WBA and WBO belts at the time. Six months after Diaz, Manny was in the ring with Oscar at welterweight. Similar to 130, the case for Mayweather at lightweight is one of mathematics. While Pacquiao was dominant while blowing out a tailor-made Diaz, Mayweather initially struggled and then handled a legitimate commodity in Castillo before padding the 135-pound resume with two more one-sided wins. He gets the nod here with clear quantity over comparable quality. Summary: Another step up in weight presented little difficulty for Mayweather, who floored veteran Corley twice in a wide scorecard win, chatted up TV announcers while toppling Henry Bruseles (TKO 8) and hammered Gatti into submission in his Boardwalk Hall backyard in 13 months. Summary: Pacquiao officially made the big time with the shocking TKO of Oscar De La Hoya at a welterweight catchweight and then dropped to 140 and left kingpin Hatton flat on his back with a single left hand after two devastating rounds. That 2009 cemented his status as a superstar. Mayweather barely lost a round, let alone anything more, in three performances as a 140-pounder, but even those top-shelf efforts are overshadowed by the chilling violence of Pacquiao’s demolition of Hatton. In the aftermath, the Englishman was driven into a three-plus-year hiatus, and the Filipino sprang to the top of pound-for-pound lists. Summary: While his KO ratio may have suffered, Mayweather transformed from premium-cable star to pay-per-view standard-bearer since arriving at welterweight. He stopped a still-unbeaten Hatton, whipped a still-relevant Mosley and dominated youngsters Victor Ortiz and Robert Guerrero, not to mention the money-making extravaganza with the rematch-seeking Filipino. Summary: Pacquiao was devastatingly effective in whipping De La Hoya and Cotto, overwhelming in outpointing Joshua Clottey and efficient in handling a skidding Mosley. In others, though, he robbed Marquez, was robbed by Timothy Bradley and wound up unconscious against Marquez. Had a poll been taken at the height of the original Pacquiao vs. Mayweather hype, there’s a good chance Pacquiao would have been a popular choice. His subsequent results, however – including the points loss to Mayweather himself and a devastating KO loss to Marquez – changed perceptions and elevated Mayweather’s pristine welterweight tenure to new heights. Summary: Much of the non-head-to-head leverage claimed by Mayweather fans over Pacquiao fans comes from performances at 154, where Mayweather beat two champions fighting at the full 154-pound limit and an unbeaten Alvarez at a 152-pound catchweight. Summary: Pacquiao jumped up, sort of, to claim a 154-pound weight class belt in 2010. He weighed in at just 144.5 pounds, while Margarito agreed to be at no more than 150 on the day before the fight. Pacquiao won the fight in clear, decisive fashion but hasn’t returned to the division since. Quality and quantity fall on the side of Mayweather at 154, where Cotto had won three straight fights and De La Hoya had scored a knockout win in his previous outing before fighting Mayweather. Those two bouts, plus the Alvarez match, represent more of a risk than Pacquiao took above 147. "Junior" had a stellar amateur career and showed signs of future success on the way to capturing a bronze medal at the 1996 Summer Olympics in Atlanta, where he lost a disputed decision in the semifinals. As a whole, Mayweather won 84 of 90 amateur fights and three Golden Gloves titles. In addition to the five divisions where he and Mayweather won world titles, Pacquiao also boxed extensively as a professional from flyweight through featherweight. He was a titleholder at 112 and 122 and fought to a draw in his lone championship bout at 126 against Juan Manuel Marquez. While an Olympic medal is certainly nice, it doesn’t carry as much prestige as the two world title belts at lighter weights that Pacquiao had collected before he and Mayweather started conquering the same division while encountering many of the same fighters. Mayweather and Pacquiao have five opponents in common: Miguel Cotto, Shane Mosley, Juan Manuel Marquez, Ricky Hatton and Oscar De La Hoya. Mayweather is 5-0 with one KO against the quintet. Pacquiao is 6-1-1 with three KOs. While it’s true that Pacquiao’s victories – particularly against De La Hoya and Hatton – were more viscerally violent than Mayweather’s wins, the actual quality of the common wins has more to do with when they occurred and in which weight class. Pacquiao gets full credit for beating the Englishman in his most natural division, but Mayweather had the tougher test in several of the other cases. He fought De La Hoya when he was a reigning champion at 154, while Pacquiao got him 19 months later in a weight division "Golden Boy" hadn’t seen in seven years. Mayweather won 11 of 12 rounds against a Mosley coming off a stoppage of Margarito, while Pacquiao got “Sugar” Shane the following year, after both the Mayweather loss and a draw with Sergio Mora in the interim. Pacquiao’s TKO defeat of Cotto came first in 2009, but it loses some luster before the defending champion Cotto was contracted to defend a welterweight title at two pounds less than the division’s 147-pound limit. When Mayweather fought him in 2012, it was at a full-fledged 154 pounds for a title belt that Cotto had won and defended twice by TKO. Lastly comes Marquez, whom Pacquiao had fought to a draw at 126 (2004) and beaten by narrow decision at 130 (2008) before Mayweather shut him out over 12 rounds in a non-title welterweight fight in 2009. Pacquiao beat him by another close decision at 144 pounds in 2011 and then lost by one-punch KO when they met at 147 in 2012. There are points to make for both men. Pacquiao is a highlight-reel dynamo. Mayweather is a peerless strategist. Both will ultimately have plaques in the Hall of Fame in Canastota, N.Y. for their accomplishments. But when the resumes and their contexts are lined up side by side, “Money” has more check marks in his column. His armload of titles is a little less broad than Pacquiao’s, but the sheer dominance of his performances against high-quality opposition from 130 to 154 trumps the lighter-weight advantages of his nemesis. Pacquiao is like an annoying ex girlfriend. Floyd already undressed you in front of the world and pacquiao wont stop calling. This cant be too healthy for pacquiao.